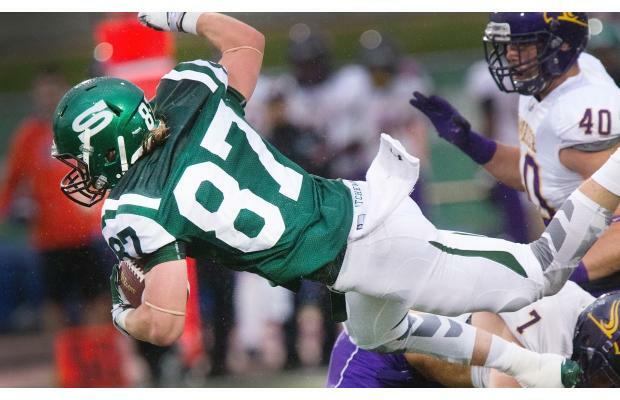 SASKATOON, SK – The Wilfrid Laurier Golden Hawks men’s football team opened their 2015 season with a 33-10 loss to the Saskatchewan Huskies in non-conference action Friday night. Third-year Saskatchewan receiver Mitch Hillis hauled in nine passes for 187 yards and 2 touchdowns on the night while fourth-year Huskie quarterback Drew Burko finished the night 13-for-20 with a pair of touchdownds and 214 yards. Kayden Johnson carried the ball 17 times on the ground with Tyler Chow rushing another nine times for 86 and 62 yards respectively. Second-year quarterback Eric Morelli of Burlington, Ont., completed 10-of-21 attempts on Friday night for 103 yards as he received the majority of playing time for the purple and gold. James Fracas of Waterloo, Ont., started the contest for the Hawks and went 1-for-5 in limited action. Greg Nyhof of Georgetown, Ont., was the top receiver for Laurier with two catches for 40 yards. On the ground it was 2014 CIS leading rusher Dillon Campbell of Whitby, Ont., with six rushes for 46 yards before getting removed from the game early in the second quarter. Morelli and Eric Guiltinan of London, Ont., took over the majority of the rushing duties from there and finished with 38 yards each. Guiltinan also scored the Hawks lone touchdown of the contest in the third quarter. For the Huskies Lance Bashutsky and Evan Machibroda each recorded five tackles and Chris Friesen picked of Laurier quarterbacks twice. Ron Kinga of Guelph, Ont., and Tanner Philp of Burlington, Ont., both had an interception for Laurier. Rookie defensive back Scott Hutter of London, Ont., was the leading tackler with 6.5. Rookie kicker Quinn Johnson of Toronto, accounted for the Hawks other four points with a field goal in the third quarter and a single in the fourth. It was the second meeting between the two programs. The only previous matchup was the 2005 Vanier Cup in Hamilton when Laurier prevailed 24-23. Laurier will fly home Saturday and return to training camp on Sunday in preparation for their regular season opener on the road against the York Lions on August 30.